NSA's Bulk Collection Of Americans' Phone Data Is Illegal, Appeals Court Rules : The Two-Way A three-judge panel said Congress did not intend to give the National Security Agency the authority to collect metadata about Americans' phone records in bulk when lawmakers wrote the Patriot Act. 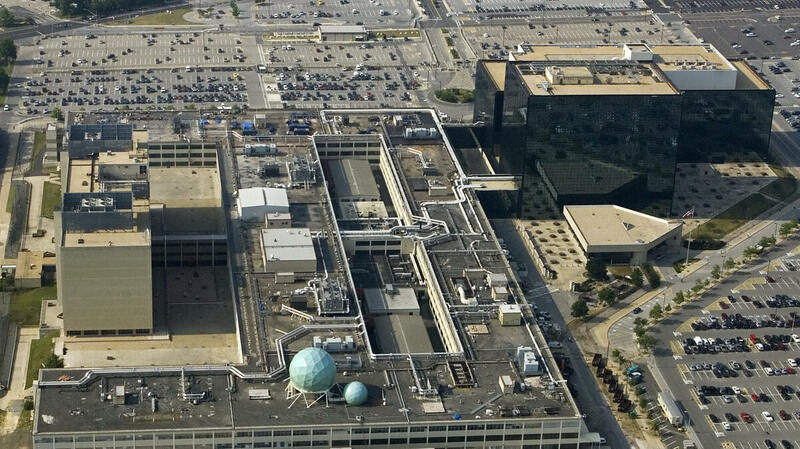 A view of the National Security Agency's headquarters in Fort Meade, Md. The National Security Agency's practice of collecting data about Americans' telephone calls in bulk goes beyond what Congress intended when it wrote Section 215 of the USA Patriot Act, a federal appeals court ruled on Thursday. The three-judge panel was asked to consider whether the program violated the Constitution. Instead, the 2nd U.S. Circuit Court of Appeals panel punted on the constitutional claim, deciding the program was simply not authorized by federal law. One of the big reasons it is hard to discern congressional intent in this case, the court wrote, is that the bulk collection program has been shrouded in secrecy. So it cannot "reasonably be said" that Congress OK'd "a program of which many members of Congress — and all members of the public — were not aware." The court concludes that it has no qualms about taking this step because if Congress wants to "authorize such a far‐reaching and unprecedented program, it has every opportunity to do so, and to do so unambiguously." According to The New York Times, this is "the first time a higher-level court in the regular judicial system has reviewed the program, which since 2006 has repeatedly been approved in secret by a national security court." The NSA's collection of phone metadata came back into the spotlight after former NSA contractor Edward Snowden leaked documents that shed light on the scope of the program. One of the first leaked documents was a secret court ruling that ordered Verizon to hand over the telephone metadata of all its customers. Metadata does not mean the content of calls. Instead it means things like time, phone numbers and duration of calls. The panel has vacated a lower court's decision to dismiss the case and has sent it back for further review. The panel also refused to order a preliminary end to the program, saying Congress is currently debating the NSA's bulk collection program. "We deem it prudent to pause to allow an opportunity for debate in Congress that may (or may not) profoundly alter the legal landscape," the panel wrote. Without specifically commenting on the court's ruling, Ned Price, a spokesman for the White House National Security Council, said President Obama has already expressed a preference for ending the bulk collection of metadata as it exists today. As we reported back in January 2014, Obama said he would prefer that the government not keep a massive database of Americans' telephone data. Instead, the data could live elsewhere and the U.S. government could query the information based on each investigation. "We continue to work closely with members of Congress from both parties to do just that and we have been encouraged by good progress on bipartisan, bicameral legislation that would implement these important reforms," Price said in a statement. "This decision is a resounding victory for the rule of law," ACLU Staff Attorney Alex Abdo, who argued the case before the three-judge panel last September, said in a statement. "For years, the government secretly spied on millions of innocent Americans based on a shockingly broad interpretation of its authority. The court rightly rejected the government's theory that it may stockpile information on all of us in case that information proves useful in the future. Mass surveillance does not make us any safer, and it is fundamentally incompatible with the privacy necessary in a free society." The ACLU also urged Congress to "up its reform game" to align itself with the concerns raised by the 2nd Circuit. "Such expansive development of government repositories of formerly private records would be an unprecedented contraction of the privacy expectations of all Americans. Perhaps such a contraction is required by national security needs in the face of the dangers of contemporary domestic and international terrorism. But we would expect such a momentous decision to be preceded by substantial debate, and expressed in unmistakable language. There is no evidence of such a debate in the legislative history of § 215, and the language of the statute, on its face, is not naturally read as permitting investigative agencies, on the approval of the FISC [the secret national security court], to do any more than obtain the sorts of information routinely acquired in the course of criminal investigations of 'money laundering [and] drug dealing.' "
"The House Judiciary Committee last week approved a revision of Section 215 that bars bulk data collection under that provision. Senate Majority Leader McConnell has a bill pending that would extend Section 215 without changes until 2020."